Missed Christmas with the family because of my flu-cold, whatever it was. So I’m about to stick things in the mail. 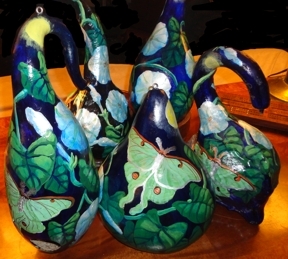 Here are the painted gourd-birdhouses ‘Moonflowers and Luna’. Painted gourds for Christmas 2013. Beautiful gourds. Where can I order one? I’ll send you one next Christmas. email me your address and what you’d like painted on one and I’ll send it.